Hi everyone! Shannah, from Just Us Four, back again to share a new recipe with you. We love Nutella in our house and so I use it in a ton of different things. My kids are always asking for pancakes but I don’t always have time to make them. 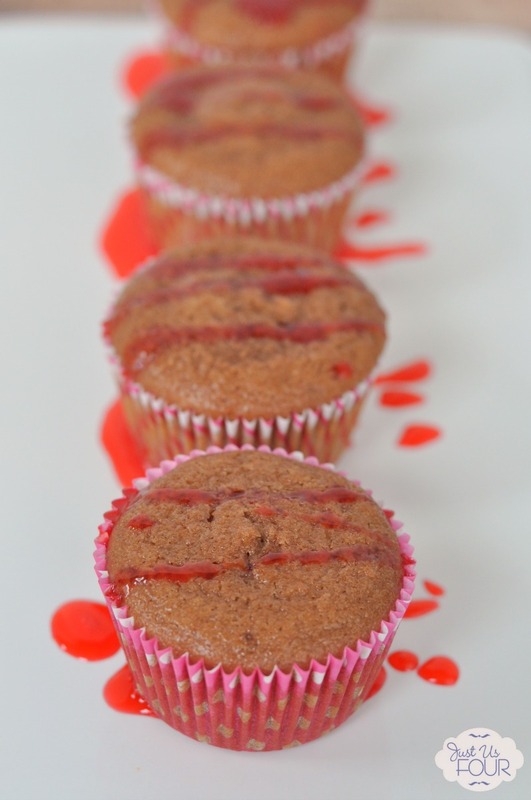 So, I decided to combine their love of nutella with their love of pancakes in these raspberry Nutella pancake muffins. These pancakes muffins are awesome because you make them ahead and just heat them up a little whenever you want. 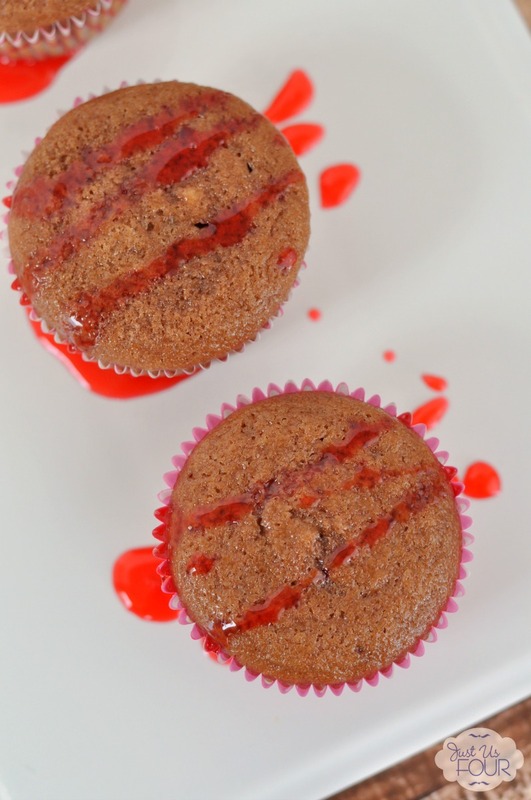 We used strawberry syrup on ours but you can easily skip the syrup all together. 1) Preheat oven to 350 degrees. Line muffin cups with paper liners or spray with nonstick cooking spray. 2) In a large bowl, combine pancake mix and water. Stir well to combine. Stir in Nutella. 3) Divide pancake mix evenly between muffin cups. 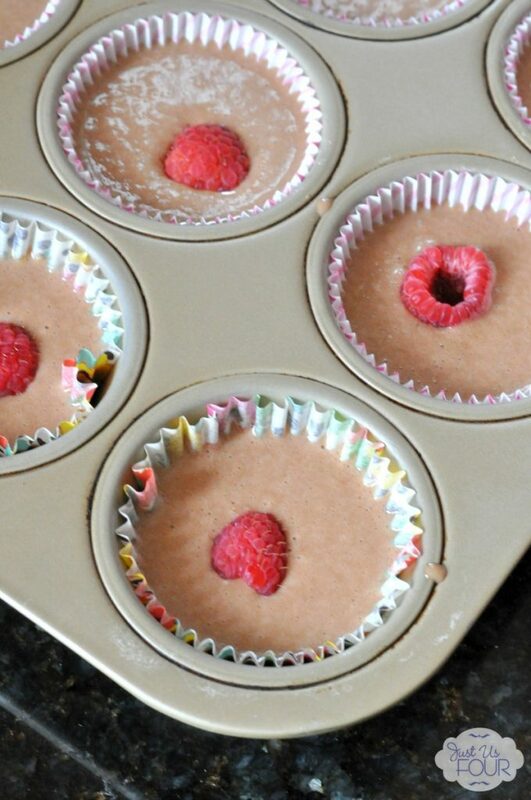 Place one raspberry in each muffin cup. 4) Bake at 350 degrees for 15-18 minutes or until pancake muffins spring back at the touch. I love how easy these are to grab and go on busy mornings. You can easily change up the fruit in these pancake muffins or leave it out all together. If you are looking for other great muffin recipes, be sure to check out my spaghetti squash egg muffins and pumpkin muffins with cream cheese glaze.